When Finance Minister Thomas Issac spoke of raising resources through innovative avenues like the sale of sand recovered from reservoirs, he may not have thought of yet another promising opportunity that exists or, more likely, he may have chosen not to introduce such a radical route especially as the member of a Leftist Cabinet. Yet it exists already and has the potential to raise thousands of Crores of rupees in the years ahead. And unlike dredging sand, it is likely to have a long term impact on the development of Kerala. And by allocating Rs 20 Crores to KSITIL, he may have set the ball rolling. It has been well accepted, even by the Honorable Finance Minister, that service industries like IT/ITES and Tourism are the way ahead for Kerala. As a densely populated region, with the lowest usable area / man ratio in India, and with few significant natural/mineral resources, it is unlikely that God's Own Country can host heavy industries such as steel, petroleum & petrochemicals, heavy manufacturing, fertilizers and power plants. Kerala has made significant strides in both industries, being ranked third among States in terms of tourist arrivals and seventh in terms of IT exports. Its IT hub, Trivandrum, is currently the 8th biggest IT destination in terms of exports. Major companies like Infosys, TCS, Wipro, UST Global, Allianz, RR Donnelly, IBS, E&Y and McKinsey have set up shop in Kerala, most of these in Trivandrum which accounts for about 75% of the industry in the State. The Government has developed over 2.5 million sq.ft. of space in Trivandrum (not including the under-construction 1 million sq.f.t Technopark Phase III) and about 1 million sq.ft. in Cochin (including the soon-to-be-inaugurated Athulya MTF). 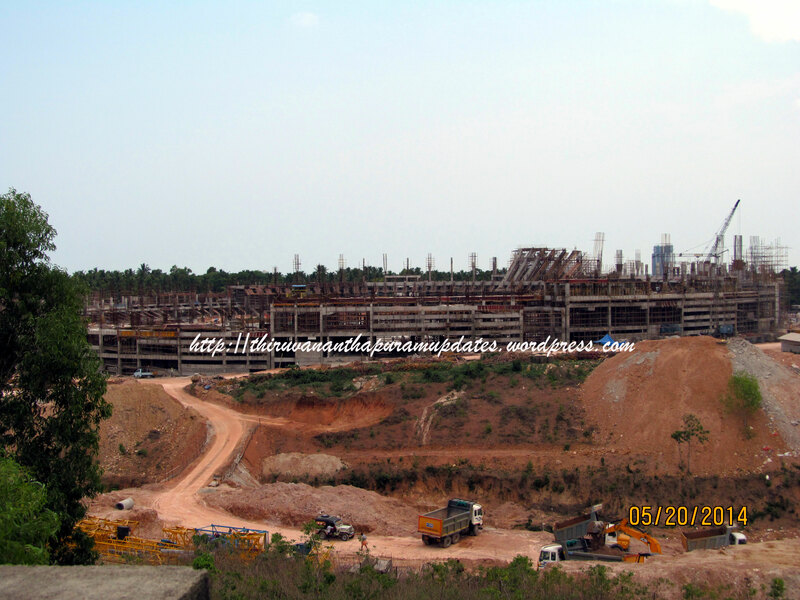 Private developers have added another 2 million sq.ft in Trivandrum and 1 million sq.ft. in Cochin. Another 1 million sq.ft. of space is being added across Kozhikode, Kollam, Alleppey and Thrissur by the Government. Finally, with over 450 acres, the mammoth Technocity project is set to add over 10-12 million sq.ft. over the next 6 to 8 years. All in all, 3.5 million sq.ft. of operation space, 2 million sq.ft of in-development space and over 15 million sq.ft. of in-pipeline space form the impressive kitty of the State Government, probably unmatched by any other State Government and matched only by a handful of leading private developers. This asset portfolio is owned by Technopark, Infopark, Cyber Park and KSITIL, all Government entities. Even when we consider that the Government will have no more than 26% stake in the projects of KSITIL and others under in the PPP model, we are looking at over 5 million sq.ft by 2011 and a whopping 10-12 million sq.ft by 2016-17. To put this in perspective, this is the same amount of area owned by DLF Assets Ltd, DLF's subsidiary which was recently merged with its parent as part of a corporate restructuring process. DAL's total portfolio is spread over about 13.5 million sq.ft (including projects in development) and it has been valued at between Rs 8500 to 10,500 Crores! Even allowing for the fact that the IT space in Kerala has lower lease rentals than those in metro locations, which makes up most of DAL's assets, we are looking at over Rs 6000 Crores of assets with the Government by 2016 with Rs 3000 Crores ready by 2011!! Well, working out how much space there is, is in itself a challenging task. Especially so, considering the fact that we are looking at a number of Government organisations and nearly non-existent MIS. Even when we have that figure, how do we work out how much the assets are worth? Without getting into Finance 101, let me spell out how this is done. Firstly, real estate assets which generate rentals - such as IT parks, malls, offices and hotels - are valued based on the cumulative value of their rentals and not on their cost of construction or market rates. Capital Value = 360/0.09 = Rs 4000 per square feet. So when the total built-up area is around 10 million sq.ft., we are talking about a cumulative valuation of Rs 40 Billion or Rs 4000 Crores. That is a ball-park figure of what the IT infrastructure assets of the State will be worth in a few years' time. And add to it the value of over 1000 acres of prime land that is also in its possession and we are looking at about Rs 5000 Crores or US$ 1.1 Billion. This could eventually grow to as high Rs 8000 Crores or US$ 2 Billion as more space and land is added. The value is tantalising but the big question is how to unlock it properly. The value of all this asset base can be unlocked only when it is put on the market, either to raise debt or equity. In short, part of the ownership of the assets has to be transferred to private individuals and entities. Before anyone yells "privatization", let's remember that KSITIL was created for the express purpose of owning IT infrastructure assets and to raise capital from the market to fund the development of this infrastructure. So it is not a new-fangled concept t all. The idea is best demonstrated in the Real Estate Investment Trust or REIT. REITs are corporations, listed or privately held, which exclusively invest in real estate. Their key aim is to own and operate real estate assets, and to distribute the revenue among the share-holders. REITs are perhaps the most common model of real estate ownership and operation and are prevalent across the developed world in markets like the US, Japan, UK, Singapore, Germany and Hong Kong. REITs help to tap the capital markets to raise money for the development of real estate projects in a structured manner and also give even retail investors opportunities to invest in real estate across a portfolio which is diversified in terms of geography, size and clientele, rather than in a single project. Globally, REITs account for as much as US$ 450 Billion of investment. Indian companies like DLF and Unitech are planning to launch REITs for some time now. The Indian regulators don't permit REITs to be traded on our bourses at present but legislation to permit them is in the offing. In the meantime, Indian firms may float REITs in the Singapore market. Floating a REIT will help the Government raise valuable capital from the market instead of going in for costly commercial debt - it has already borrowed over Rs 600 Crores from banks for ongoing projects. Since the Government intends to retain 51% of any market entity, a future REIT could raise up to Rs 2000 - 2500 Crores by diluting the remaining 49% into the market. By mandating a specific ratio to be owned by FIIs, PSU banks and the general public, the Government can ensure that the ownership of the REIT is never called into question. Indeed, it could eventually dilute its stake further and yet retain complete operational and strategic control. The REIT will pay out its rent-derived profit as dividends each year, which is yet another way of distributing the benefits of the IT revolution to the public. The Government's share of the dividends could be ploughed back into improving IT infrastructure or repatriated to the exchequer. As I have mentioned about a year ago, KSITIL needs to become a unified entity to own and manage all the IT infrastructure assets in the State. This means that a few years down the line, by 2012 or so, Technopark, its smaller siblings - Infopark and Cyberpark and its even smaller siblings in the other districts will have to be merged into KSITIL to create one integrated asset development and (more importantly) management organisation. And as a REIT, answerable to the media, KSITIL (or Kerala IT REIT - KITREIT) cannot afford to be a one-room, one-employee operations like it continues to be today,more than 2 years since its formation. The organisation needs a professional team of asset managers and financial whiz-kids to take care of its mammoth portfolio, to ensure that its shareholders get a good deal and to ensure that it maximises the development of the IT industry in Kerala. Well, is anyone listening to this? Sadly, I doubt it but as key decision makers like Dr Issac imbibe global business practices and mould them to the Kerala way of doing things, we can hope that a REIT will be floated in Kerala in the not-too-distant future. Don't you have to include the debt raised by the Govt to build this infrastructure in the final valuation? IT is what the government should concentrate on. With some support from Govt, it will go a long way. @ KK - You are right, one needs to factor in current receivables, liabilities et al into the final valuation but I was keeping things simple. The external debt for the projected REIT would be about Rs 800 Crores at present. The key task is to prevent it increasing. wow.. You taught me a lot by this post! Impressive Ajay. Thanks for clarification. Does the current debt of 800 Cr include the debt raised for Tachno Park Phase 1, 2,Infopark Kochi and InfoPark Kalamassery . Does it also include the amount raised by the govt for land acquisition of the following entities TechnoPark Kollam, Infopark Cherthala, Info Park Ambalapuzha and CyberPark Calicut? You have hit the nail on the head.It is one thing to obtain a loan and a different ball game to generate revenues and make repayments.Govt's primary job is to create an ideal environment for investors in terms of road,water,power,law and order which includes no knee-jerk bandh etc.It is fine when they venture into these kind of initiatives,but they themselves sometimes seem to create doubts in the minds of the investors.Another infrastructure Trivandrum needs is the extension of the proposed Kochi LNG-Kayamkulam line to Trivandrum. Trivandrum on the F1 Map!